One of my work colleagues adores lavender scented products and was recently raving about the A French Kiss Bubble Bar from Lush, which I'd not heard of before. I mentally added it to my wishlist and a few weeks later she surprised me with one as a present, which was really lovely of her. 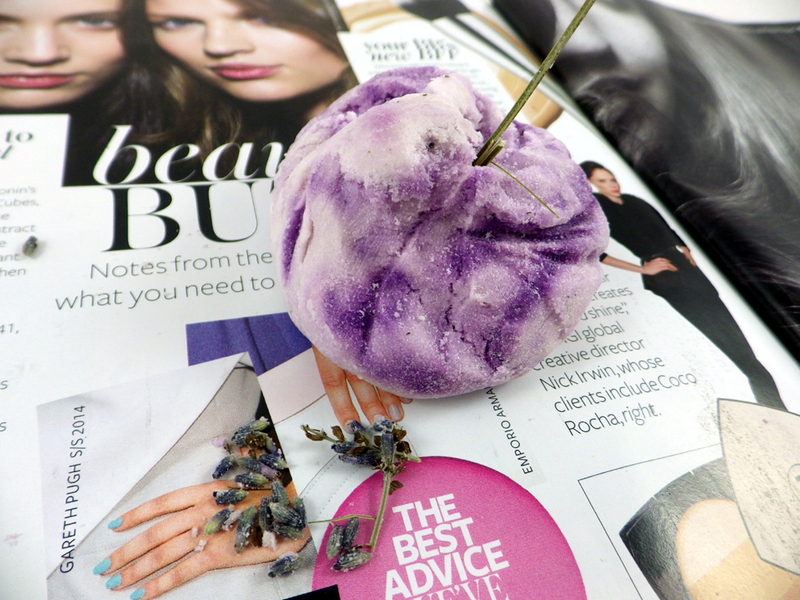 As you may have guessed, the A French Kiss Bubble Bar's main ingredient is calming lavender - it contains Lavender Oil, Lavender Absolute and even a Lavender Sprig that is slotted into a little hole in the bar. The ends of my sprig came off in the bag, but I did pop them next to the bar on the photo so you can get an idea of what it would have looked like! The bubble bar also includes Extra Virgin Coconut Oil to moisturise and soften the skin and Rosemary Oil for its relaxing and antiseptic properties. The A French Kiss Bubble Bar is quite small, so I used the whole bar in my bath, although you could get away with using half if you're not too bothered about having lots of bubbles. 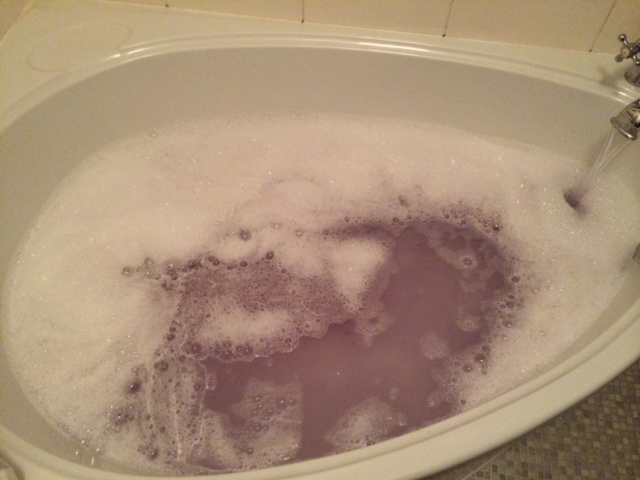 It turns the water into a light purple colour and when you get into the bath you can really feel the oils softening your skin. The bar also smells amazing. The lavender scent is quite strong as you would expect; not to the point that it would give you a headache, but strong enough that you can really feel its calming and relaxing effects. When I got out of the bath I felt half asleep already and could barely get a word out to my fiance when I got into bed- I felt that tired! Predictably I went to sleep straight away. The A French Kiss Bubble Bar costs £4.25, so is fairly expensive considering you can only get 1-2 uses from it. However it works so effectively that I'd recommend everyone stashes one of these away in their bathroom cupboard, ready for that really stressful day when you just can't unwind. You can buy it online here. Have you tried the A French Kiss Bubble Bar? 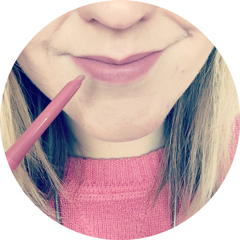 What are your favourite lavender based products? WOW i must pick this one up when i visit lush, sounds like something i need right now! Oh it sounds lovely, I love lavender scented products. From living between home and uni for the past three years and the areas having a different water type I've realised that the hardness of the water plays a great part in how many bubbles you get. At home I can have a bath overflowing in bubbles from a quarter of a small bubble bar, but at uni an entire bar would create only a small amount!